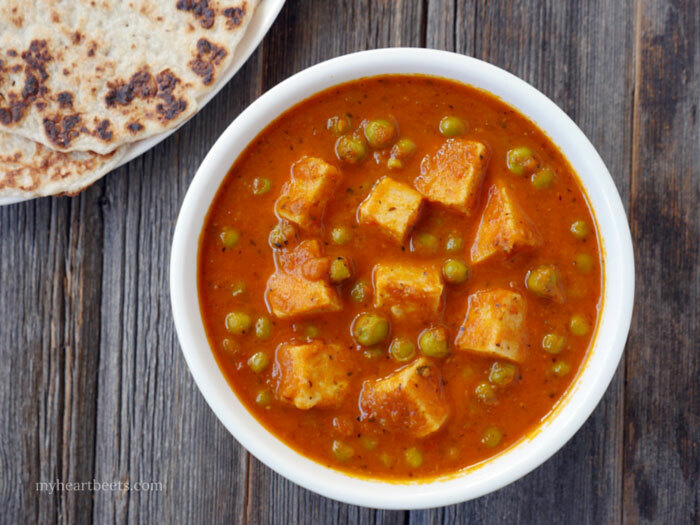 Mattar paneer is an easy dish to make. I’m talking easy peasy 😉 The easiest way to make this dish or any Indian dish is to prepare all of the ingredients before you begin. Gather the spices together in a bowl. Chop the onion, garlic, ginger and tomato. Then, just follow the steps. You’ll have a big bowl of savory deliciousness in no time. Want to try my paleo Paneer? Then check out my eBook, South Asian Persuasion: 100+ Paleo-Friendly Indian Recipes! Melt ghee in a dutch oven or heavy pot over medium-high heat, add cumin seeds and once they begin to splutter, add the onions. Stir-fry the onions for 5 minutes, or until they begin to brown. Then add the garlic, ginger, Serrano pepper, and stir-fry for 1 minute. Add the tomatoes, stir-fry for 5 minutes, then turn off the heat. Add this mixture to a blender (or use your immersion blender), and blend until smooth. Pour this back into the pot, over medium heat. Add the spices, stir, then add the water and the peas. Bring the mixture to a boil, then reduce the heat to medium and cover with a lid. Cook for 10 minutes, stirring at the halfway mark. Stir in the coconut cream and turn off the heat. Stir in the paneer and cook until heated through – if using dairy-free paneer stir it right before serving. 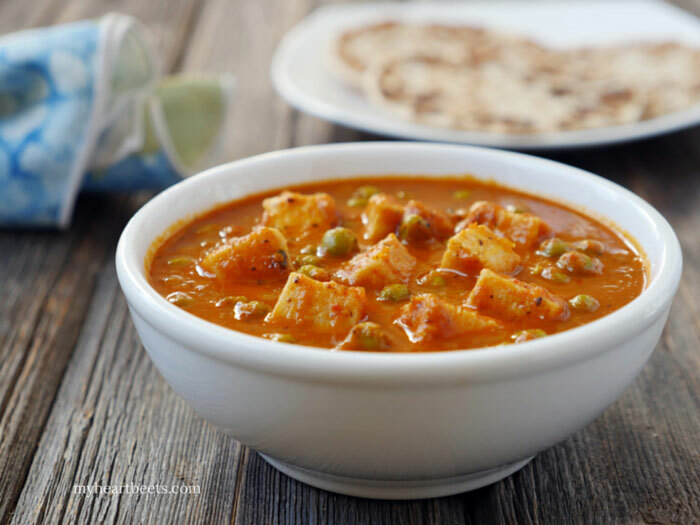 Dairy-free paneer will soften, but should not completely melt unless the curry is too hot. Hi! This recipe looks really great! Would you do anything differently if making this with regular paneer? Thanks, Caitlin! Just add the paneer cubes at the end and simmer for 2 minutes in the sauce. Or, you could always first shallow-fry the paneer cubes in ghee or oil to make the edges a little crisp before adding it to the sauce. Let me know how it turns out!! I am SO excited I found your website. My husband is Indian and this month we went Whole30 and we miss our Indian food with roti, naan, rice, paneer etc.! He will be thrilled at dinner tonight! 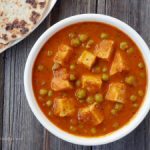 Mattar paneer is my favorite vegetarian dish so I am excited to buy your book and try the paleo version. Thank you. Okay, so… for the first time *ever* making one of your recipes, it didn’t turn out quite as I expected. Ack! I know! I’m as surprised as you are! But I think I have an idea why. My mother and I made it together, and since my parents are tolerant of dairy, we used regular cream (half & half) at the end instead of coconut cream. I used maybe 1/3 cup of cream and for whatever reason, it wasn’t enough to thicken up the gravy (it also didn’t help that my mother only has a Ninja blender, not a high-speed one for step 4). I’m thinking that maybe if dairy cream is used, there needs to be more of it. The coconut cream probably provides a vehicle for the flavors to come together, right? It just didn’t work with the quantity of dairy cream we used and I was left thinking “something’s not quite right here… something is missing.” If/when I try the recipe again, I’ll probably use more dairy cream (or honestly, just go with the coconut cream!) and let you know how it turns out! TL;DR If you’re using dairy instead of coconut cream for step 6, use more than you think you need! Faith, bummer! Was it too watery? Because that can be fixed by reducing some of the liquid? Good to know about regular cream, hopefully that’ll help some readers! Oh, yes, it was a little too watery! That’s a good note, we should have left it on longer to reduce. Or just use less water next time! I made this with sweet potatoes instead of paneer because I am vegan. Delish!!!! I would love to try this recipe and buy your book, however the security of my information is important to me and unfortunately the website to buy your book isn’t secure enough for me… Is there any other place to buy your book? Hi, I have an SSL certificate on my website: https://www.southasianpersuasion.com – and so it is secure. Not sure why you think it isn’t? You can email me at [email protected] if you’d like. Thanks! love love love your recipes, thank you! This one is another home run. I reduced the amount of chili powder, and halved the amount of water. Plus, I cooked the onions for a while to really cook them down. Turned out fabulous, everyone asked me to make it again. I LOVE your recipes and want to buy your book. Is the paneer really dairy-free — no ghee? I can’t even do ghee. Thanks!! Awesome! Thank you so much! I cannot wait to make it! We made this last night, and although it was delicious, the cashew paneer didn’t really hold up in the curry. They softened a lot, almost “melted”. The paneer were really good outside the sauce, on their own. Is there a way to make them even more firm? Hi Brad, thanks for letting me know how this turned out for you! Unfortunately, gelatin melts in hot liquid which is why I suggest adding the cashew paneer at the very end right before serving. I have yet to figure out a way to keep them really firm. Dairy-free cheese is tough to crack and this is my best attempt so far. Sorry if this wasn’t the answer you were looking for! Ashely, thank you so much for the response. We put them in at the very end, but they tended to melt while we were eating. Still very, very tasty. I like that your Indian recipes are not overly complicated and come out delicious. Thanks for the excellent recipe. Can I sub the onion/coriander/ginger/garlic/tomato for 1/2 of a cup of your onion masala? Or should I be adding something else back in? Also, how many oz of paneer do you use? You can use a 1 (12-14 ounce) block of paneer or however much you’d like! Hi Michelle, 1/2 cup of onion masala would be my guess too but I haven’t tested it. The good thing is that since the onion masala is already cooked, you can always add an extra 1/4 cup at the end if you think it needs it. Let me know how it goes! Unfortunately I felt this was too watery, even though I followed the recipe amounts exactly. I felt the amount of water also blunted the flavours of the spices. I prefer creamier, thicker sauces and I love your Butter Paneer ( I think that’s the one..) so I shall stick to that paneer curry in future. It doesn’t look like a IP recipe? Hi. Thank you for your recipes. I love Indian food and your recipes make it very accessible. If I used fresh peas instead of frozen, would I have to precook them?